McClain senior Kobe Penwell shoots a three pointer over a Miami Trace defender on Friday at McClain High School where the Tigers hosted the Panthers in FAC action. Freshman Bryson Badgley shoots a three pointer from the corner on Friday at McClain High School. The Tigers used a 30-3 run in the third quarter to take control of the game. 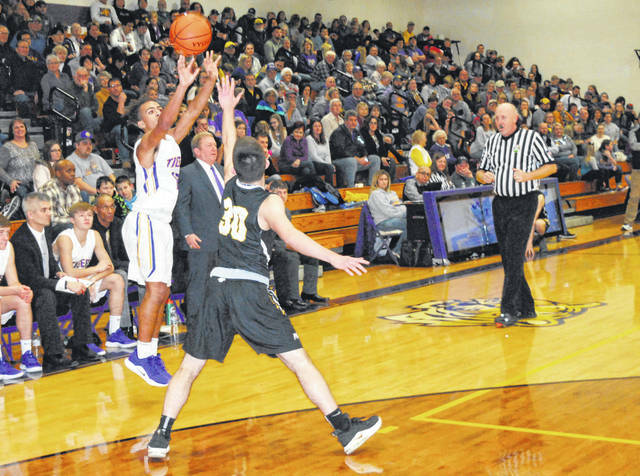 GREENFIELD — A packed house inside of McClain High School’s gymnasium on Friday were treated to a superb third quarter of basketball by the home-standing Tigers as they ran roughshod over the visiting Miami Trace Panthers and outscored them 30-3 in the quarter en route to a 67-34 Frontier Athletic Conference win. The Tigers combined to score 28 points over the first two quarters of play and Kobe Penwell led the charge with three triples including two in the first quarter as he totaled 13 points in the first half. Miami Trace started the game hot from the three point line as Trever Barker and Kyler Conn each hit two three pointers and Conn totaled eight points in the period as Miami Trace trailed 17-16 after one quarter of play. The Panthers took a brief lead early in the second quarter when Cameron Moore and Ethan Steele scored seven points for Maimi Trace as they took a 23-20 lead. However, from there the Tigers outscored the Panthers eight points to one and took a 28-24 halftime lead. Penwell continued to light up the scoreboard in the third quarter as he hit three more triples in the frame to reach his game high total of 22 points. 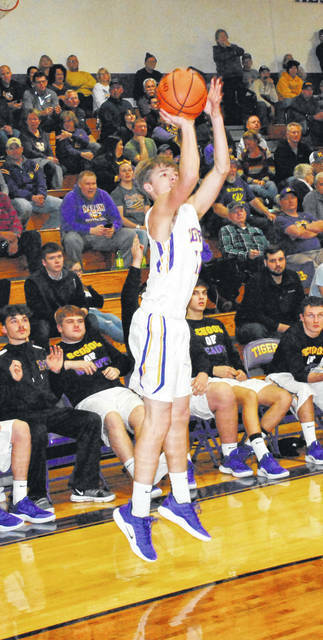 Bryson Badgley added a three of his own and a layup a short time later for five points in the quarter, and Dalton Mischal had eight points to help the tigers put the game away early. Logan Rogers had the lone field goal for the Panthers in the third as he hit a layup following a Miami Trace timeout with just over five minutes to play in the third. The Panthers were unable to find the bottom of the net again until Austin Matthews hit one of two at the charity stripe with 1:59 to play in the period to account for Miami Trace’s three points in the third. The fourth quarter was merely a formality with McClain leading the Panthers 58-27 but McClain’s Ethan Cockerill took the opportunity in the opening minutes of the quarter to score two buckets and push the McClain lead to 62-27 before he was subbed out of the game. The Panthers Braden Osbourne went to the line three consecutive times for Miami Trace in the fourth but was only able to convert one of his five attempts. Miami Trace is scheduled to take the floor again on Friday, January 25 when they travel to Hillsboro to take on the Indains in an FAC matchup. McClain is scheduled to travel to Dayton-Caroll on Tuesday, January 22, to compete with Patriots in a non-conference matchup.